From the Baldwin County Courthouse, go east on Hancock St. one block. Turn right (south) on Wayne St. Go straight on Wayne St. for one mile. Jog left onto Vinson Highway. Continue on Vinson Highway (Hwy 112) for 4.7 miles. The James B. Helton brick home will be on the left. Currently the sign reads Emerald Acres Farm - 2650 Vinson Highway. 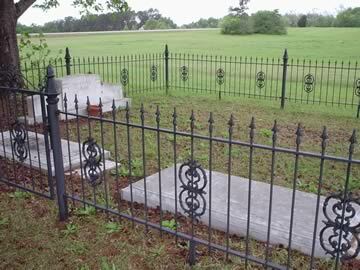 The cemetery is visible from the road and is about 100 yards from the highway.